So when I was growing up, spaghetti was an event. Spaghetti and meatballs that is. My mom’s spaghetti and meatballs. Took all day to cook and it was worth the wait. It almost always was a meal on a weekend and we would have leftovers during the week. That meal to this day is very special and still very much an event. I do enjoy cooking up a pot of spaghetti and meatballs from time to time, but my family loves and I mean LOVES spaghetti. And as much as I love them, I do not have time to make a pot of spaghetti and meatballs as often as they would like it. So I often turn to spaghetti and meat sauce. 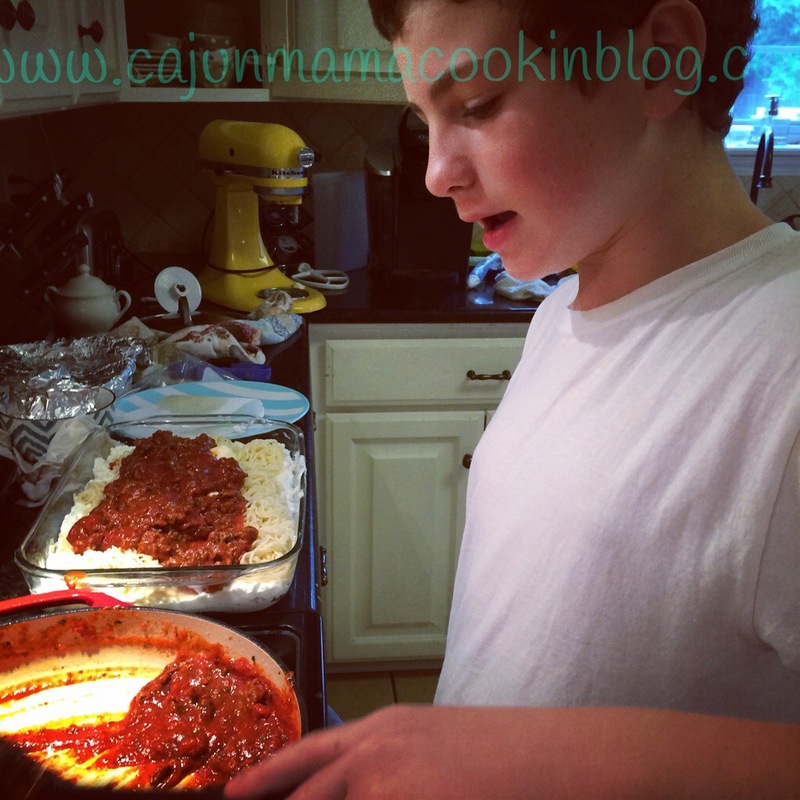 My oldest prefers meatballs (mix of pork and ground chuck mom, STAT) but he will endure meat sauce if he has to. Of course, as much as I adore tradition, I am always looking for good variations on our favorite meals. I like to shake it up sometimes, keep it fresh, and make some noise (ha! Like I have to do that…these cookoo loos over here make enough noise for 3 households) but you get what I am saying. I like to stay out of the dinner time rut. So when I came across this recipe on Pinterest for million dollar spaghetti a while back http://ashleykaitlin.blogspot.com/2011/01/million-dollar-spaghetti.html?m=1, I knew I had to try it. Well this week has been, um, interesting to say the least. It started off that way and it continues to be so. For different reasons. Swimming pool calamities, sick kids, sick hubby and it’s only Thursday, so I figured let’s just blow it out and doing something crazy! Let’s make million dollar spaghetti!!! Or it went something like that. I have said it before and I will say it again, when things are stressful on the home front and I have an inkling of that feeling that I just want to bury my head under the covers and cry, I shift into crazy homemaker mode. I know that few things are in my control, but what I cook and how I feel in my home, is all me. So I cook something traditional and comforting or I try something new. I try a cleaning tip and do some laundry. I guess my home is my center and I find comfort there. I guess it’s the Narcille and Beulah Mae coming out in me and every other Cajun mama I come from. Cook your pasta according to package directions. Brown ground beef until no longer pink. Drain well. Stir spaghetti sauce into the drained ground beef. Heat until warmed throughout. 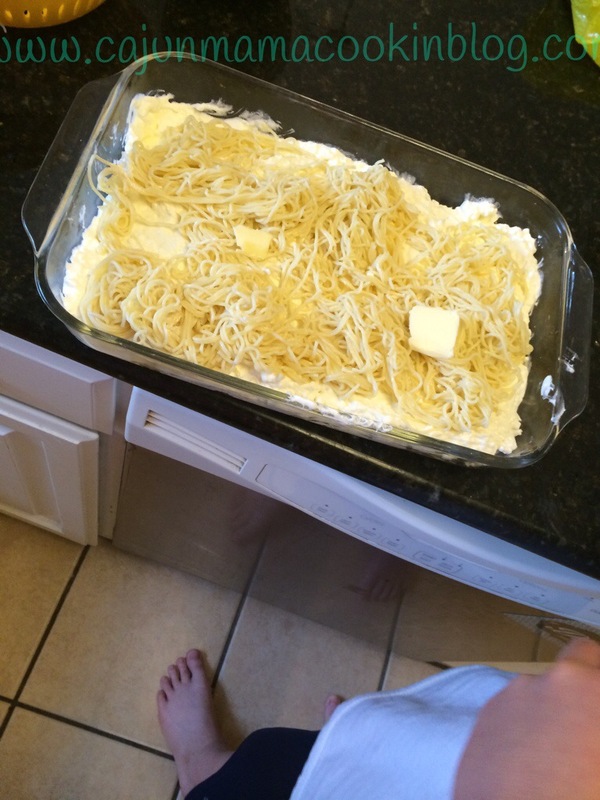 Put half of the butter (sliced into pats) at the bottom of a 9 x 13 dish. Layer half of the noodles on top of this. 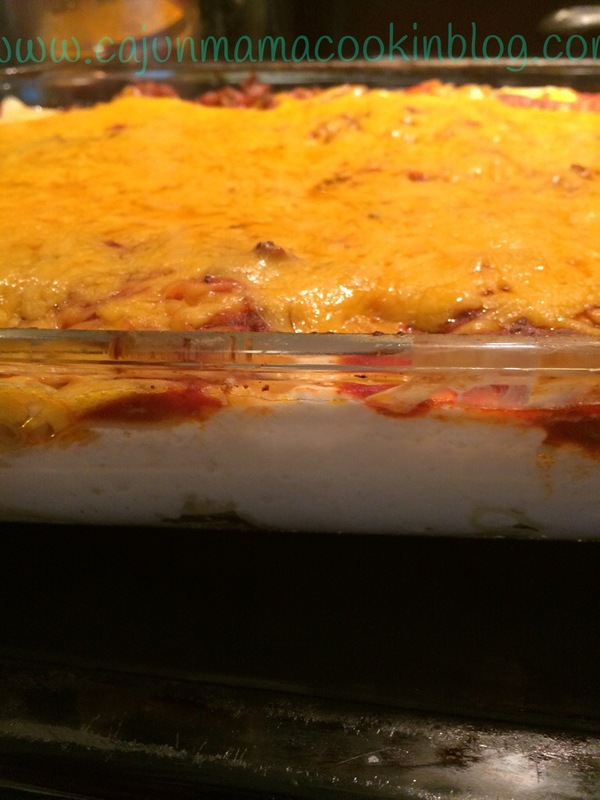 Now layer all of the creamy mixture on top of this. 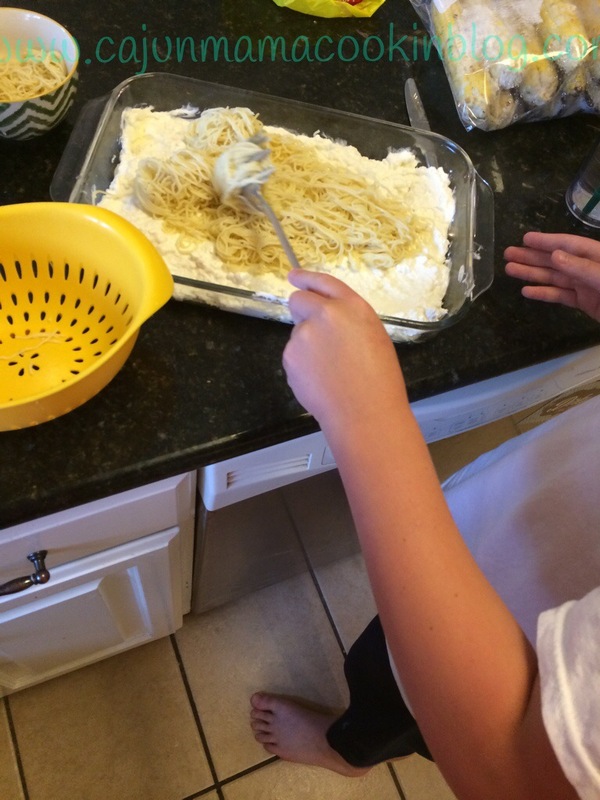 Next, layer the rest of the noodles on top of the creamy mixture. Lay the rest of the butter pats on top of the noodles. Now spread the spaghetti sauce and meat all over the top. Cook at 350 for 30 minutes. Finally, sprinkle the cheddar all over the top of the whole shebang. Cook for another 10-15 minutes or until the cheese is all bubbly and irresistible looking. my handsome boy helping me cook and telling me all about his latest google research. He amazes me. *cut the green part off the berries and then slice them up. Add to a gallon size storage bag. 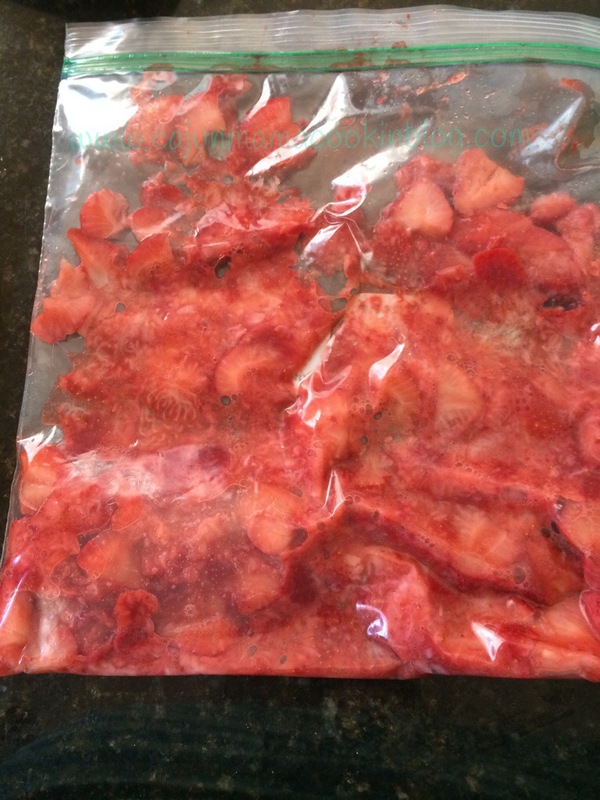 Close the bag well once all strawberries are in. I did as Christy Jordan suggested and used a canned good to crush the berries. Just gently roll the can across the closed ziplock bag. It works like a charm. crushed strawberries . Easy peasy. Preheat oven to 350 degrees. Spray two 8 inch round cake pans or 1 9 x 13 pan with Baker’s Magic or coat with oil and then flour them. In a mixing bowl, add cake mix, eggs, milk, oil and gelatin. 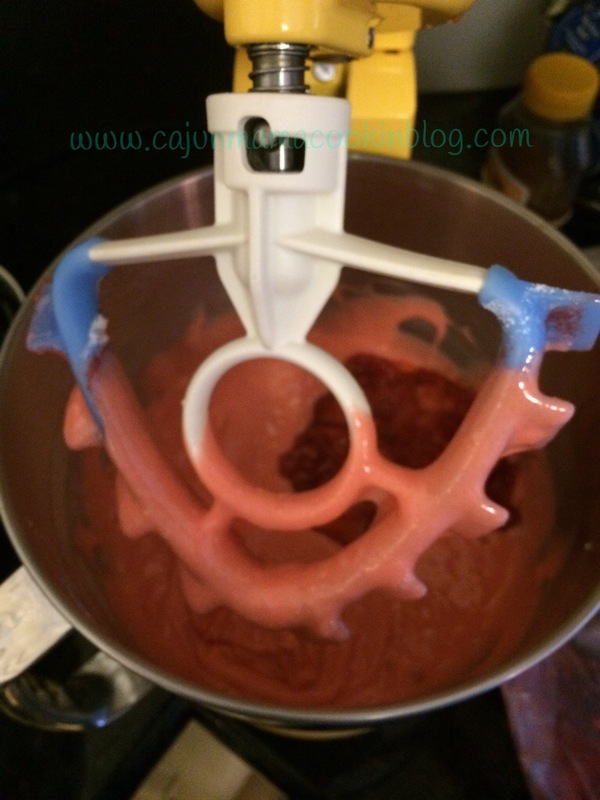 Using standing mixer or hand mixer, mix until all ingredients are combined. About 2 minutes. Next add in crushed strawberries. Mix again until the berries are incorporated well into batter. Pour into prepared baking pan (s) and cooking until a toothpick inserted in the middle comes out clean. I did the 9 x 13 and it took about 35-40 minutes. Allow cake to cool completely before icing. While cake it baking, go on and get your icing ready. I just washed out my standing mixer bowl and used it again. In a medium size bowl, combine the softened cream cheese and butter and powdered sugar. Mix until smooth. Resist the urge to eat with a spoon. If you desire, add in the rest of the crushed berries you did not use. I like the way it looks and the taste is out of this world. CJ suggests it is prettier without the berries, but I disagree. Each to his own, so do your thing. You can’t lose either way!! Once cake is cooled, ice that baby and cry your happy tears that you made a cake that is so luscious and pretty. Yay you!!!! look at that pretty cake mix! the icing. Will be my undoing. S.O.S. Wow!! 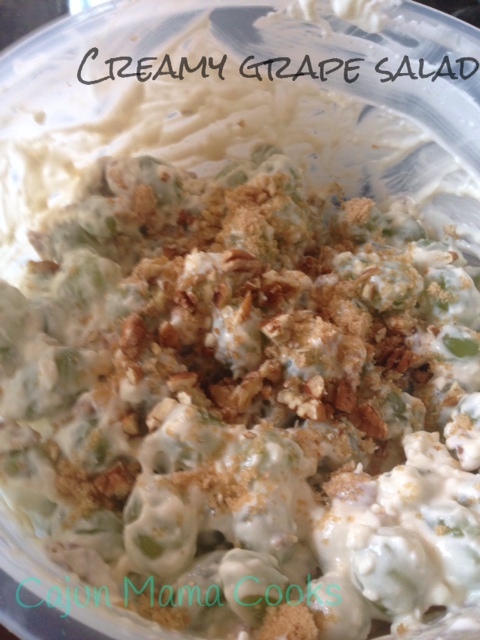 I came across this recipe for grape salad on Pinterest a few weeks ago. I was really hungry at the time I think, or it might not have appealed to me at the time. I am so glad I was open to something unexpected and new, because this salad is a flavorful explosion of textures and sweetness in your mouth. A virtual party. One you weren’t sure you really wanted to go to, but felt obligated to attend and then enjoyed staying far too long and having a blast. Yes, just like that. It is creamy, slightly nutty, sweet with a little tang from the green grapes and it is just so fabulous. Me and my sweeties…so much of life is unexpected joy. Wash and dry the grapes, In a large bowl, combine the cream cheese, sour cream, white sugar and vanilla. Add grapes and mix until the grapes are well mixed with the other ingredients. Mix in brown sugar and pecans gently. Refrigerate until ready to serve. I sprinkled a little more brown sugar and chopped pecans on top before serving. Holy moly…get ready for the explosion. mmmmmmmmmmm…. Unexpected joy indeed. Oh my the sweet creaminess of it all!! I love brunch. I am not sure if I have ever shared that little tidbit with ya’ll…but I do. It is just such a convenient meal. It is so versatile. It can be as big and fancy of an ordeal as you want, but it can be laid back and relaxed if you choose. You can have such a variety of foods when you plan a brunch too. It is a culmination of all things good. It’s an ANYTHING goes meal for the most part. Who doesn’t love that? The part I enjoy the most about it is that I can have a cup of coffee or two before I have to get cracking. That makes for a much happier household and Cajun Mama likes happy. Now, when you factor in that brunch makes it perfectly acceptable to drink at 10 in the morning, that just pushes brunch to the top of my list. Mimosas, Bloody Marys, and coffee with Bailey’s in it. I mean….what is not to love? Over the next few days, I will be sharing my favorite brunch recipes. I have some yummy, super easy ones and some that are a little bit more involved but totally worth it. We can call it Blog About Brunch Week!! Extra, extra bloggin about brunch, ya’ll!!! Hope you will come back for some more scrumptious brunch recipes. I am sure it would not tax anyone’s imagination to find out that I have an entire Pinterest board (or two..) dedicated to brunch foods. So, when I ran across this Breakfast Danish casserole, it was an absolute shoe in for me to try ASAP. I made it once a few months ago and it was a hit across the board. Perfect with coffee and a definite kid friendly dish. It is like dessert..at breakfast! This is so easy to prepare, I can do it after only one cup of coffee. That is pretty easy…let me tell you! I had been pondering what to make for our Christmas morning breakfast. I wanted to do a brunch so that it would give us a chance to let the kids open their gifts and give us something more substantial than cinnamon rolls from the can. Don’t get me wrong, we LOVE cinnamon rolls from the can…just wanted to do something more special for Christmas morning. 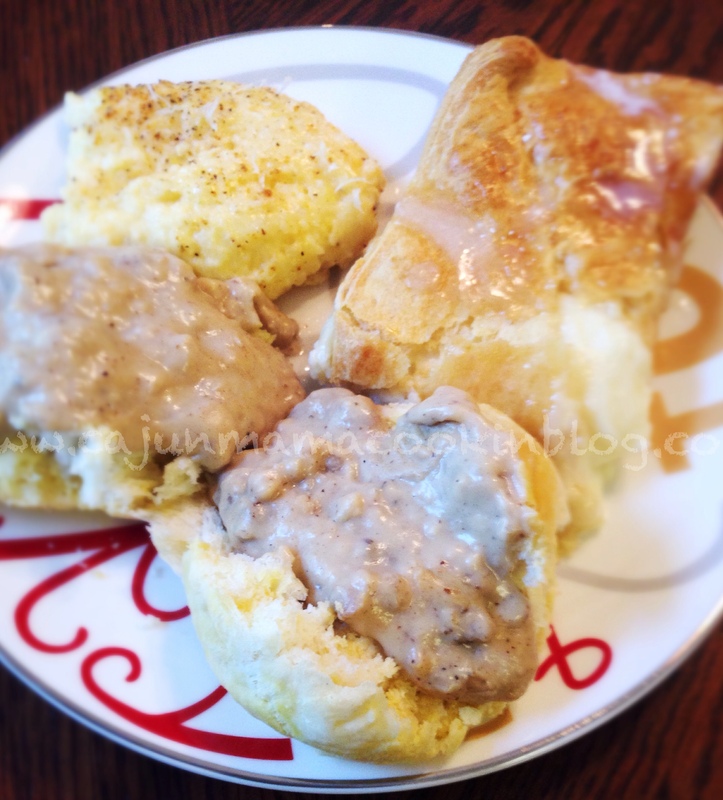 Big Daddy asked me to make biscuits and sausage gravy, so I knew we would have that and I LOVE grits and I have an excellent recipe for a cheesy garlic grits casserole (hint hint at my next post)…but I wanted something sweet to round it out. Yes, I could have chosen fruit and we usually put that in there, but it is Christmas morning and I felt like breaking a few rules. Being naughty after being nice for so long. LOL!! Plus, I didn’t have any fruit and there was no way in the world I was fighting the lines at Brookshires or Kroger to buy fruit. So, breakfast danish casserole it is!!! This was an EXCELLENT brunch menu. With some fruit to add some color and nutrition to it, it would have been perfect! It was pretty much a cinch to make and everyone was happy and full. Preheat oven to 350 degrees. Prepare a 9 x 13 dish by spraying it with a light coating of cooking spray. Lay out one tube of crescent roll dough (don’t separate) in one long piece on the bottom of prepared dish. Pinch together any separated pieces or use your pastry roller. 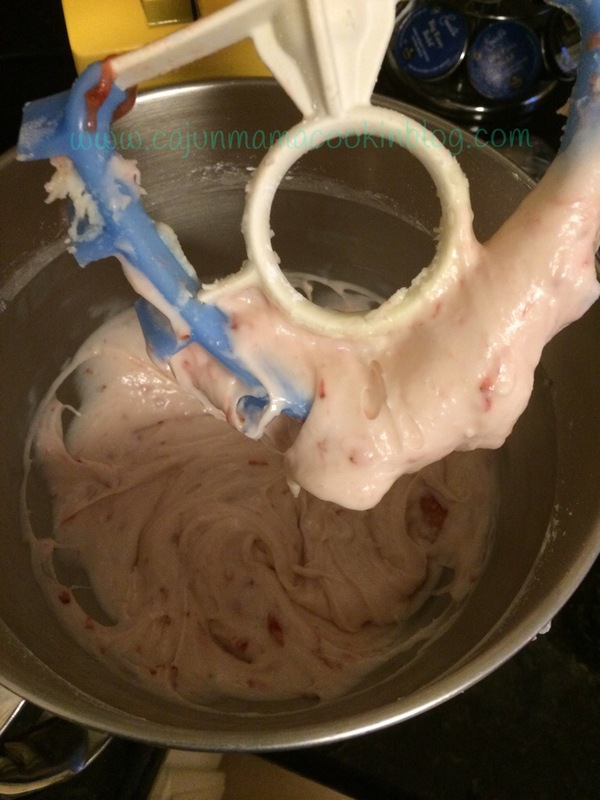 In your standing mixer, cream together cream cheese, sugar, egg, and vanilla until smooth. Spread the mixture evenly over the layer of crescent roll dough. 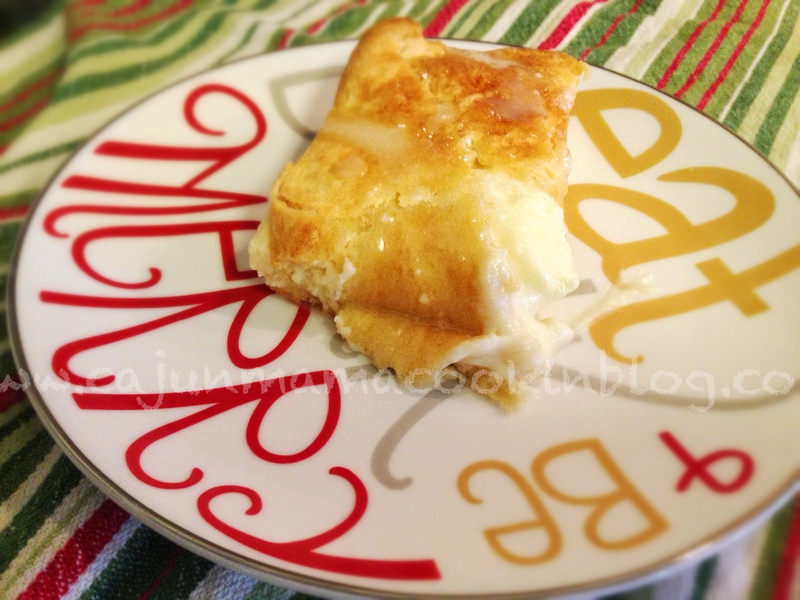 Lay second tube of crescent roll dough over the cream cheese mixture. Brush the top with the egg white to ensure a nice golden brown top crust. Pop this into the oven at bake for 35-40 minutes until the top is golden brown. While the casserole is baking, make up your glaze. It couldn’t be easier. Dump powdered sugar into a small mixing bowl. Add a little milk at a time, whisking after each pour of milk. Add milk gradually until you have a mixture that is a little more runny than a paste. You want it to pour but not be super runny. Not as thick as peanut butter, but not as thin as syrup. Does that make sense? Probably more like molasses. Whisk in a splash of vanilla. When danish casserole is out of the oven, let it cool for about 15 minutes. Pour the glaze over the semi cooled casserole. Cut into squares and serve. This will stand alone with a cup of coffee or a glass of ice cold milk. You will love it. I promise. Ok now some people call these Oreo Truffles. I admit that does sound fancier. But when my sister, Jenny, offered me one for the very first time, she called them Oreo Balls. So it stuck. 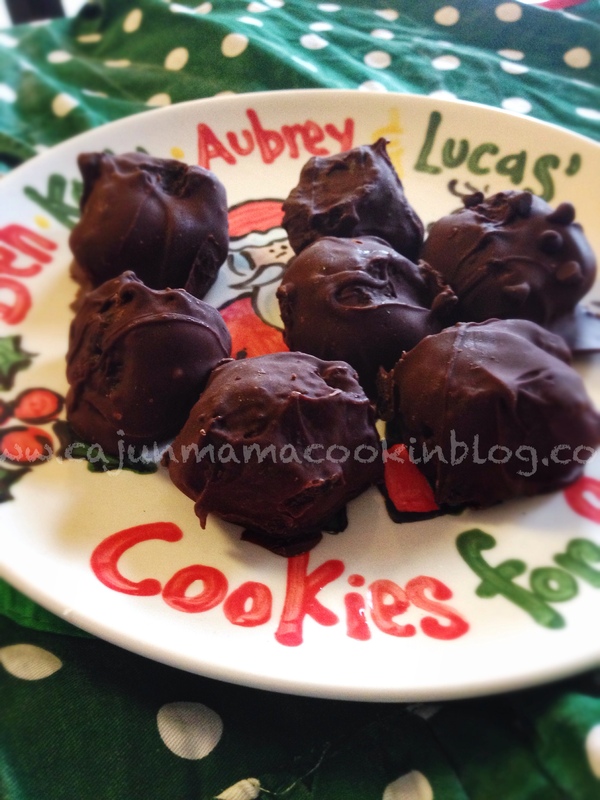 My kids ask for them by name…Oreo balls. And so it is. These things are so tasty and a wonderful addition to any dessert buffet. Perfect party treat. They can be easily packaged into cute gifts. Teacher appreciation gifts? Put them in a clear treat bag, make a tag that says “It’s been a ball being in your class! !” , punch a whole in the corner and tie it to your treat bag with some colorful twine. It’s in the bag…literally!! They are superb treats for your neighbors, especially if you are into ding dong ditching. You can use vanilla candy quick and put the food coloring of your choice in and voila…yummy, edible party favors that go with your color scheme. I could go on but I know ya’ll want me to get on with it already and so I will. You can use vanilla candy Quik, white chocolate chips, chocolate candy quick or semi sweet or milk chocolate chips. I am working on a mint variation right now. Mint oreos with those limited edition Nestle mint chocolate chips. I will let ya’ll know. You really truly can do almost anything with this recipe. Make it your own!! Now that the lovely people at Nabisco are offering so many different varieties of Oreos, the options are nearly endless. Now, I use my food processor to crush my Oreos. You want them to be ground until they are almost like sand and the food processor works perfectly. I get that not everyone has a food processor or wants to get it out for this task, so you can also put them in a gallon size Ziploc bag and take a rolling pin to them. This also works great for getting rid of some pent up aggression. Unless you don’t have any…if that is the case, you can bring them to me and I will crush them for you. I have plenty of pent up aggression…kind of makes me wonder why I missed the opportunity to smash cookies with a rolling pin? Hmmm…need to consider this next time. Anyway, once this is done put your cookies crumb sand into your standing mixer bowl or a regular mixing bowl along with the softened block of cream cheese. Mix away until it is well combined. Now, you are going to make them into uniform balls. I just take a spoon and scoop some up and roll it into a ball. Line a cookie sheet with parchment paper and place your balls on parchment paper a few inches apart. Now, melt your candy quik according to package directions or put your chocolate chips in a microwave safe bowl and microwave for 30 seconds at a time, stirring in between each round until they are melted. Taking one ball at a time, roll in the melted candy quik or chocolate chips. I will tell you, this can get messy. 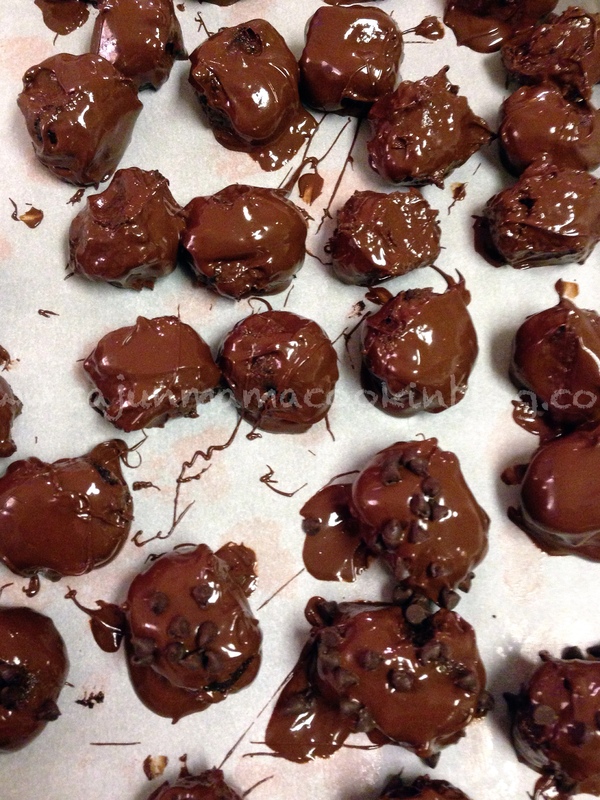 Place each dipped ball back on parchment paper once you are done until each ball is covered. If you want, you can put some sprinkles or mini chocolate chips on some or all of the balls. It gives them a little added texture and makes them look especially festive. My kids like them plain, so I usually do half and half. Put them in the fridge over night or for several hours at least, to cool. Get ready to make more because they will disappear quickly. Big Daddy says these are “tasty” and he is not usually a dessert person. The plan was to have some left for the man in red…yeah…there is one left. Onto plan B. So for those who don’t know, I am a “stay at home” mom. You would think that this would leave plenty of time to cook lovely homemade nutritious meals every night. It doesn’t. That is what they tell you in the recruitment brochures, but they lie. Don’t buy it girls. It’s all lies! Lies I tell you. 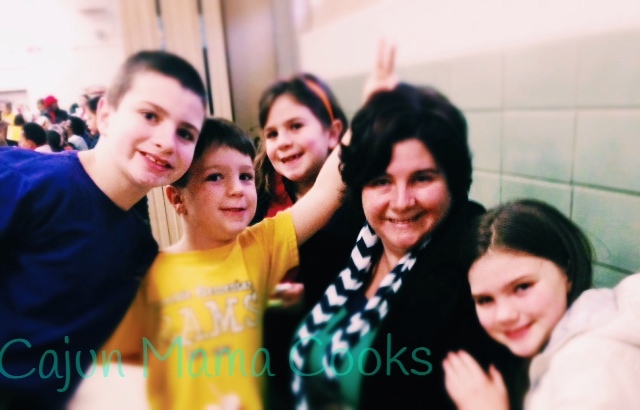 If you are a stay at home mom with a new baby, cooking a meal every night is not that easy. Unless you are an octopus. I am not. If you are a stay at home mom with a bunch of little darlings underfoot every day, like I was not that long ago (4 under 5 at one point) it really doesn’t get much easier. Someone is always falling, fighting, crying, needing to nurse, and on and on. I realized the other day that we ate out or got takeout a whole bunch more when my kids were younger. My point in saying all this is leading up to something…promise. I tend to ramble. I am Cajun remember? I like to talk. ha ha!!! Ok anyway, I was “home” more when all the kids were home and I still didn’t have time to fix a meal many days. If I did, I was out of something or forgot to defrost the meat. Mommy brain and exhaustion (dynamic duo) can do that to you. So…you would think that now that my kids are all in school…4th grade, 3rd grade, 1st grade and kindergarten that I would be able to lovingly prepare healthy and delicious homemade meals each night. Yeah…I would like to tell you that I do. I would love to tell you that it all comes together flawlessly each day. Um..no. Sure, I do cook. Obviously I do. I do a lot better with planning my meals these days, unless my cooking ADD kicks in. BUT, you can plan all day, but the best plans can go astray when dealing in the world of kiddos. Carpool. Homework. Yeah, if I don’t get supper started before the monkeys, I mean darlings, get home, it is going to be a long night. Or somebody is eating oatmeal. I’m serious. So…in theory I started this crock pot week for “ya’ll” but it was mighty fine to have supper cooking while I went about my daily business of eating bon bons and watching soaps. bahahahaha!! I wish. 🙂 So I thought to myself as I was serving up those bowls of potato soup how nice it would be for my friends who work outside the home to have a good meal fixed when they get home. Especially if you have kids and after school activities. This just spurred me on. Especially after that potato soup was a WINNER!!! I have really high hopes for this beef stroganoff so we shall see. It is cooking right now so no pics yet, but again I will update. 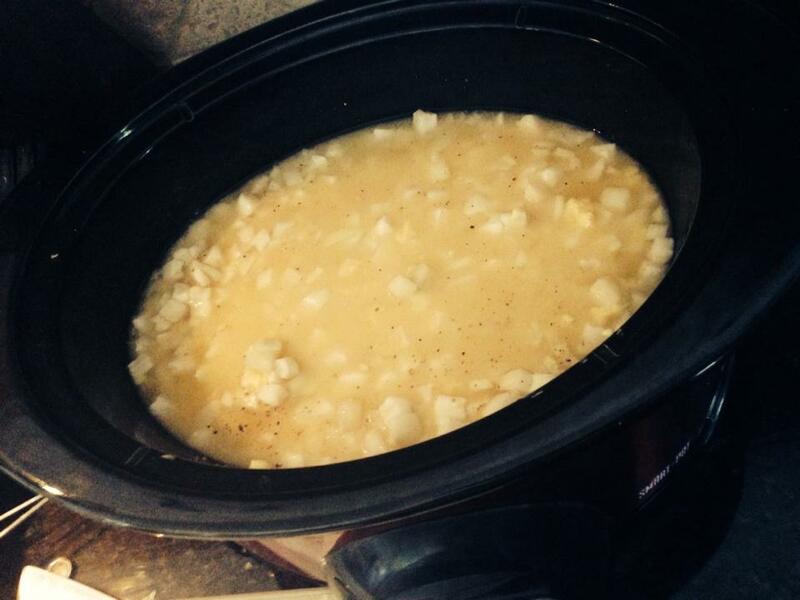 I really hope ya’ll are with me on this crock pot revolution…I need another crock pot though. In a medium size bowl, whisk together the soups, water, Worcestershire. Pour into the slow cooker. Now add your meat. Cook on low for 6-7 hours (it says 8 but mine never takes the full 8 hours)…turn the crockpot on high and cut cream cheese into cubes and stir it in. Put lid back on and cook for about 10 minutes or until the cream cheese is combined. 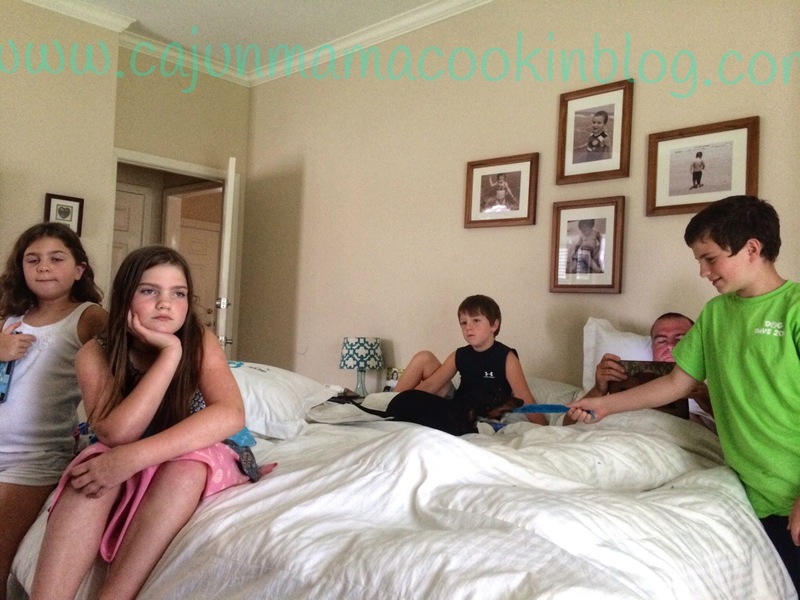 Well the crock pot frenzy continues over here in Cajun Mama’s kitchen. Fall is in the air, the windows are open, breeze is flowing in, I have a sinus headache and the circle of life in the South continues. 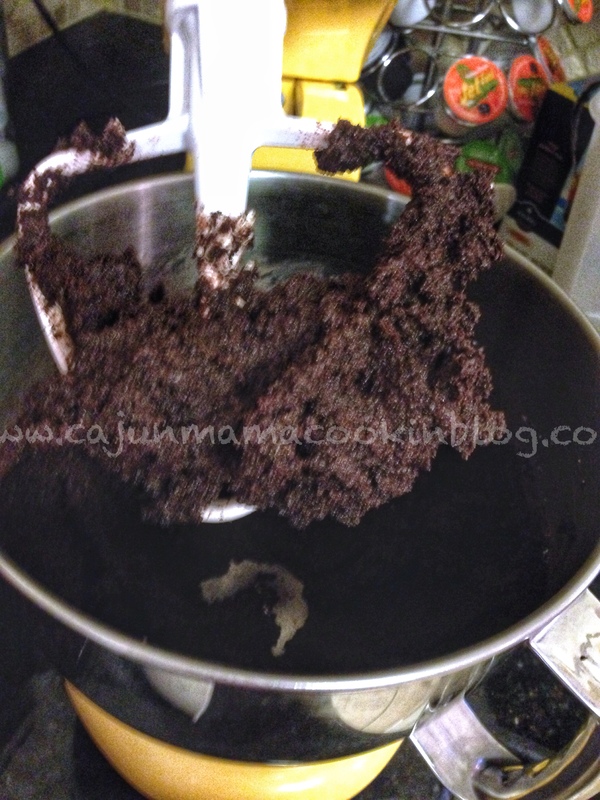 I am hoping that you read my post from yesterday about it being crockpot week on cajun mama. If not, just scroll on down and read that post. Now, I don’t have a picture of this already prepared as it is currently in the process of cooking, so I apologize. On the flip side, I am ahead of the game which is a good feeling! 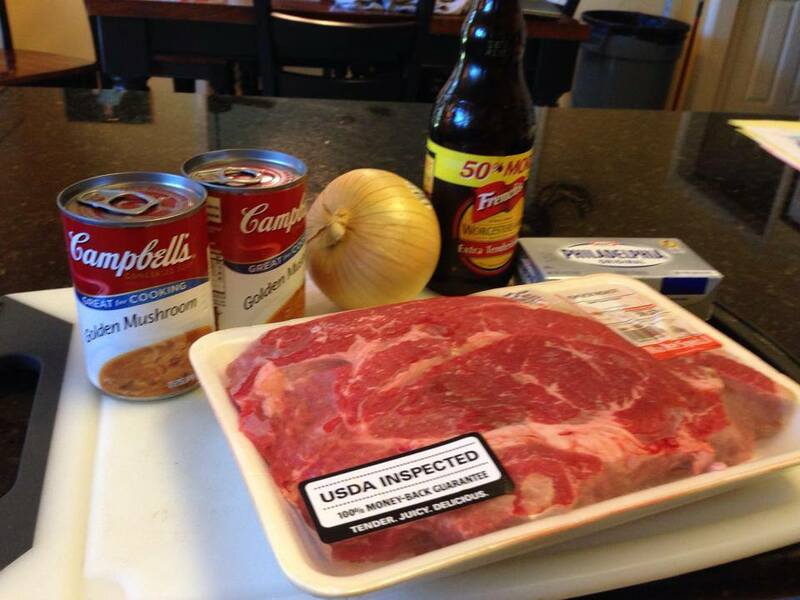 Also, this is my first time to try this recipe but really…how bad can it be? No, it is not the ultimate potato soup. 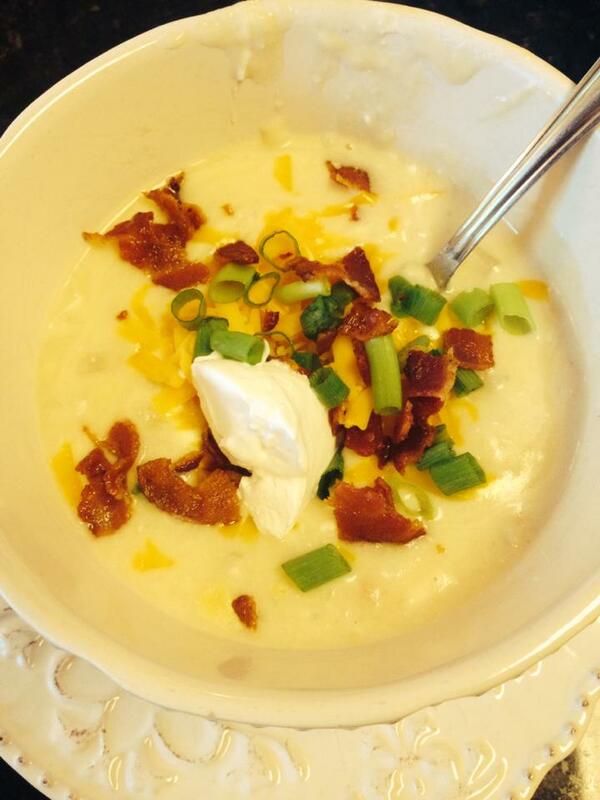 I found quite a few potato soup recipes that I would have rather tried but this one definitely caught my eye and the reviews were great. The difference between this one and the others is that this one is made in the slow cooker and requires almost no prep work. This week is about convenience and saving time. This one qualifies. I hope we all just love it and it becomes a keeper. Only time will tell or approximately 6 hours on low. Ha ha!!! As a side note~today has been what I call a shady Tuesday. You think Tuesday would be great because Monday has the rep for being “the bad day”. Shady Tuesdays are like that. Bad Tuesdays. Tuesdays are given far too much credit as far as I am concerned. One thing that has given me a little smile and sense of comfort as I clean bright yellow laffy taffy out of the carpet is that I have something yummy (I hope) in the slow cooker. One less thing to worry about. Now I will get the rolls rising and I will be smiling big time. (um…no not from scratch? don’t ya’ll know me at ALL? I mean that frozen dough. Defrost and then rise.) Take that Tuesday!!! This is at the beginning of the cooking process! Dump all of the ingredients except for the cream cheese into your slow cooker. Crock Pot. What have you. Give it a good stir and then put the lid on. Let it cook for 6-7 hours. Add the cream cheese and stir. Put lid back on and let it cook for another hour or until cream cheese is melted and then stir to combine. Now, I have a crock pot with a timer function. I set it for 6 hours and let it go. This is wonderful feature because you don’t have to worry about getting home to shut it off on time. A great idea for my friends with jobs outside of the home!! Check the seasoning if you desire and add salt and pepper to your liking. Ladle soup into bowls and then add optional toppings if you want them. Enjoy!!! And relish in the fact that you are so AWESOME that you are able to prepare supper while you are not even in the kitchen. That is multi-tasking at its very finest. I am woman (or man)! Hear me ROAR!!! Of course once my family and I try this soup, I will come back and add some additional comments depending on how we like it and what may need a little tweaking. Thanks for reading. Drop me some comments if you want. I would love to hear from ya’ll!!! !